"I have read your Cat Behavior ebook and think it is brilliant. All this information in one book and updated for free as new knowledge becomes available. Thank you very much!" "A great book, all you need to know to deal with 98% of the behavioral problems in the normal domestic cat. Very useful to have all the information in one place." Will Your Cat Not Use The Litter Tray? Is Your Cat Peeing On The Carpet? Do You Want To Understand Your Cat? Is your Cat SCRATCHING In The House? Is your Cat SPRAYING ? If so we can help you, we have been there, done that and have all the T shirts regarding understanding your cat. After 28 years in vet practice we have seen most behavior problems you can think of and a few you cannot!! Frustrated With Your Cats Behavior? This E-book Reveals Techniques To Understand And Solve 95% Of Your Cat Related Problems On Your Own "
Information Has Been Obtained From Many Sources, Veterinary Text Books and Many Other Cat Behavior Related books (both In Print And On The Internet). We Have Also Reviewed Feline Behavior Related Information From All Over The World Wide Web. All This Information Has Then Been Interpreted With Our Own Experience As Vets And Cat Lovers. We Know What Works and What Does Not In A Practical Sense! We Love Cats... We eat and sleep all things Feline! 1) Click in the box below to sign up for our Cat Behavior Mailing list. This is totally FREE and we will send you a free E-Book consisting of a collection of Questions that people asked us and our replies while we had an "Ask a question campaign .." prior to launching this web site and for a number of months afterwards. The most popular questions were on cat aggression, how to stop cats spraying, cat fighting, cats and inappropriate urination. The idea is we will then send you regular updates on aspects of feline behavior and health we think are appropriate, You can unsubscribe at any time. The replies give a good overview of how to deal with the most popular feline behavioral problems. 2) You can purchase the main E-book we have created , "An Owners Guide To Cat Behavior Problems & Solutions ". This used to retail at $27 on line then we found on the volume we were selling we could actually cover our costs at on Amazon by selling for the Kindle yet still help as many cats and the people they own! 3) A third option is to purchase one of the 3 smaller versions are specific for the most popular feline behavioral problems we have encountered. This was Cats Spraying, Cats Scratching Inappropriately and Feline Aggression (to other cats and also humans) These retail at $7 each, so as you can see the main E-book is much better value for money if you can afford it. 4) Finally just browse around the site, go to our blog and we hope the free information available will help you and your cat. Please remember we are real vets and not Internet Marketers or Salespeople so you will not get loads of hype on this site. Solving most feline behavior issues takes knowledge, time and patience. We try to present honest useful information packaged in our guides to save you loads of time trying to find these facts all over the Internet or from well meaning friends and family. We aim to save you money in vets fees once you learn when you must go to the vets and also when you can start to remedy the problems with your cat at home, without veterinary intervention. We actually demonstrate solutions on real clients cats in our question and answer section of the book. You can never beat experience when dealing with feline behavioral problems. We try to demonstrate the difference between FACTS and more importantly KNOWLEDGE in our guides. Everyone can now find facts on the Internet but only with experience do you then develop knowledge to apply the facts you have learnt. This is what we all pay professionals for. This Web Site and E-Book Is the Result of Some 250+ Hours Of Work By 2 Vets With Over 25 years Experience, a true labor of love. Veterinary Text Books and Many Other Cat Behavior Related books (both In Print And On The Internet). We Have Also Reviewed Feline Behavior Related Information From All Over The World Wide Web. If you would like a definitive answer to your individual question click here to gain access ON KINDLE to our An Owners Guide To Cat Behavior Problems and Solutions. This will give you the background understanding you need to effectively deal with any cat behavior problem that may arise, as well as offering you quick solutions to put into action immediately. Because they are so smart, Cats can be quite difficult to train. They think so fast and catch on so quickly, it's critical to catch them early and help them develop the right habits so you both can live "happily ever after" together. This is much more important than in dogs!! Because we love cats so much (both as cat owners and professional veterinarians), we have created what we hope, will be a definitive guide specifically on feline spraying, inappropriate urination & defecation, where we teach you everything from the basic knowledge needed to understand your cat and then tell you how to apply this knowledge on this specific problem in a very practical way. We also include a Quick Fix / Case History section which you can dive straight into if all you want to do is pick up some practical tips to start correcting the specific problem, in the shortest time possible for example spraying. Another UNIQUE feature of this guide is that our clients and many cat owners on the Internet actually helped us finish it. This was because we spent @ 2 months actually setting up an ASK campaign to check we had all the relevant information in the guide. This consisted of a question page asking for peoples most pressing feline behavior problems. We replied to every one whom entered our survey and this confirmed we were on the right track. The various replies are all included in this book. Cat Aggression to owners, mainly when being stroked..
How to Stop Cats scratching Walls, Furniture etc.. This E-book is a must have for you as a cat owner whom wants to get the very best out of your relationship long-term and yet at the same time quickly solve your individual cat behavior problems. If you're serious about solving your feline behavior problems we suggest you get this report, right now and most importattly read it and take action today. How much is this E-Book Worth? Just one visit to see your Vet or to see an Animal Behaviorist can easily cost over $100, and that is just for one behavior problem. While you should see your Veterinarian when ever you suspect a medical problem may be present, this Guide can go a long way towards solving this common behavioral problem on your own! Our primary aim is to make this book available to as many cats and their owners as possible at the lowest price. This low price however in no way refelects the high quality of the contents inside this book. Remember if you download the book, read the relevant sections twice ;-) and you are still having problems please send us an E-mail and we will see if we can help. However we are both working vets so it may take a short period before we can get back to you. .
Get inside your cat's mind and learn what he or she is thinking. "Cats are independent, by which I mean smart." If you and your cat are not 100% thrilled with the information in this book... then please contact us within 8 weeks and we will quickly provide a full refund - with no objections and no hard feelings. All we ask is that please, before you return it - for the sake of you and your cat, at least look at the case histories. I know you'll find some information that will improve the life of your cat. We have been very lucky with our cat as he has never been any bother, that is until we recently redecorated our dining room. For the first time he took to scratching a dining-chair leg. I confess my first reaction was to scold him but it didn't seem to make any difference. A friend told me about your web site and I discovered the solution in chapter 2! Tom (my 4 year old cat) did not like having his face wiped but your advice worked like magic. You have already saved me a trip to the vet, though I still need to replace the chair! I enjoyed reading other chapters, too, and appreciate knowing more about how Tom's mind is working. Your obvious love for cats shines through! Thank you so much for this user-friendly guide to cats and at such a reasonable price, too. Dear Sarah and Paul, my problem is they are actually urinating on the surfaces. I took them to the vet for a check up and they are in perfect health. I have confined them to the garage, which they hate. Every night I will allow them out when I can watch them. I love the tin foil idea. I will keep you posted. They are scheduled to be neutered on Feb. 14th. Thanks again for you assistance and the brilliant E-book. "Dear Paul and Sarah- Thank you for your thoughtful and helpful response. A major factor in George's behavior was our aged dog who has passed away January 5. She was 18+ years old and getting very uncomfortable. Without her in the house George as become less nervous and easier to coax out from under the bed quilt. In fact, he spends more and more time with us which we are enjoying and he must be too. I will implement your suggestions, especially the cleaning of the urine carefully around the house. With one cat it should be easier and cleaner than ever. Thank you again." Thank you. You mentioned things I have never heard of before. I will definitely try your suggestions! "Hi, I just want to say thank you so much for your help. I sent in a question about my cat and I am following your instructions and i see a big difference. My cat used to knock things off of the dresser but now i am ignoring him like you told me to try. He will knock one or two things off, but when he sees that he is not getting my attention he stops. He's getting better night by night." We have also produced a series of 3 Mini Guides on the topics we find are most common both in our surgery and also in the client survey we carried out when starting this web site. If you are having problems with a spraying cat, READ this guide to save hours of searching and it will allow the most focused use of your time in solving this behavior. Also this guide is GUARANTEED with a money back pledge if you are unhappy in any way. 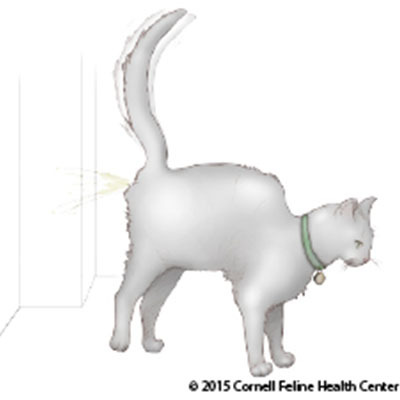 Targeted, Practical Information Specifically On How To Stop and Prevent Cat Spraying and Inappropriate Urination NOW! We hope this will be a definitive guide specifically on feline spraying, inappropriate urination & defecation, where we teach you everything from the basic knowledge needed to understand your cat and then tell you how to apply this knowledge on this specific problem in a very practical way. We also include a Quick Fix / Case History section as in the main guide which you can dive straight into if all you want to do is pick up some practical tips to start correcting the specific problem, in the shortest time possible for example spraying. This mini E-book is a must have for you as a cat owner whom wants to get the very best out of your relationship long-term and yet at the same time quickly solve your individual cat spraying, inappropriate urination & defecation problems. Tom a gorgeous and lovable neutered 4 yr old male, was brought into the clinic for an examination due to a sudden onset of inappropriate urination. In this case it was found to represent spraying. It is very important to make, sure especially with sudden onset problems that your cat does not have an underlying medical problem. This topic is covered extensively in the E-book. Diagnosis of the exact type of inappropriate urination is also very important as the solutions for each type are very different. The client was at her wits end as her partner had decided the cat would have to be put to sleep as this was a new house and the smell of urine and the damage caused was too much! This is often the case with feline behavioral problems that the spraying, aggression, scratching etc.. puts a great strain on relationships in a household. The steps needed with any behavioral problem as indicated here are an accurate diagnosis, to include finding the actual cause of the upset behavior and the actual exact type of behavior being exhibited. Then offering a range of practical solutions that owners can implement easily. Once we had made sure tom had no underlying medical problems (very common in neutered sedentary males). We offered a number of solutions and the lady downloaded an early copy of our E-book. When re-examined the cat had reduced the spraying by 75% in 4 weeks. However due to the length of time it had already been going on, it will take some time to stop the behavior completely. Also in this case the underlying cause (a new dog in the house) could not be totally eliminated, much to the cats disgust ;-). After reading the E-book both our client and her boyfriend realized that if they had done things differently from the start they probably would have prevented the spraying becoming established in the first case!! Discover And Use The Secrets Of Cat Behavior To STOP Your Cat Scratching Your Walls, Furniture, Carpets etc Now! Is Your Cat Destroying Your House? What your cat is doing appears perfectly reasonable to to them; in many cases it is their NORMAL BEHAVIOR!. Remember there are 2 sides to every story, your cat is actually trying to tell you something. However are you prepared to listen and can you understand the message. We can help you understand your cats communication and then provide you with an answer and thus a Solution To Your Cats Scratching Problems . Diagnose your cats scratching problems easily and find practical SOLUTIONS to implement NOW to stop the behavior! The importance of differentiating between medical and behavioral causes of scratching. Discover And Use The Secrets Of Cat Behavior To STOP Your Cat's Aggressive Actions To You and Other Cats. Is Your Cat Aggressive To You Or Other Cats? Is your cat suddenly being aggressive to you for no reason especially when being stroked!! Does your cat suddenly attack you with no warning. Is your cat aggressive to other cats. We know from our experience as vets with our own clients, and from the many questions we have answered from online surveys we have done with cat owners, that feline aggressive behavior is a major problem. In many cases we have prevented cats being put to sleep due to the disruption that can be caused in a household. We often find this also puts a great strain on relationships if your cat is without warning attacking you or other household cats! The newer the house and relationship the greater the anguish! Also the newer the house the more likely you will see this abnormal behavior pattern. This is explained in the e book. Though remember as we said earlier the cat thinks all this is normal...! Diagnose your cats aggression problems easily and find practical SOLUTIONS to implement NOW to stop the behavior! The most common reasons for cats starting to show aggression. The importance of differentiating between medical and behavioral causes of abnormal behavior. The main types of feline aggression and why you must be able to tell which is which for effective control. Please remember as mentioned earlier, if you and your cat are not 100% thrilled with the information in this book... then please contact us within 8 weeks and we will quickly provide a full refund - with no objections and no hard feelings. 2) Download from Amazon An Owners Guide To Cat Behavior Problems & Solutions , a complete guide to understanding your cats behavior and solving a wide range of behavioral problems. At over 100 pages the best buy on the site. 3) Download one of the mini guides each dealing with a specific feline behavioral problem, Stop Your Cat Spraying, Stop Your Cat Scratching Inappropriately, Prevent Aggression In Your Cat. 4) Browse the web site and especially our Blog and we hope you find some useful information. Your relationship with your cat is our prime concern and we sincerely hope we can help. If you feel this site does not live up to our mission statement offering compassionate care, a quality service and value for money please let us know how we can improve .